The data we all have on our computers is very important to us. You might have saved a lot of essential files, important documents, pictures and videos on your computer. Now, imagine your operating system crashes! Or a virus attacks your computer! And, you don’t even have a backup of all the data that was on your computer. It will definitely be a nightmare come to a realization. Losing important data is not a fun story. Your boss might not be very happy if you lose some important work-related documents or files. And, you might even get into a lot of trouble because of this. Well, there is no point in blaming your computer. The operating system of a computer can crash due to many reasons. There might be some software related issue or it is also possible that there might be some fault in the hardware of the computer. There is also a possibility that certain virus attacks your computer and consequentially you lose all of your data. However, the point is that no matter what the source of the problem might be, now you have to find out a solution to the problem. Fortunately, if you accidentally lost your data due to any technical problem or even by mistake, that it is not the end. The files that you lost still exist somewhere deep down your computer. It is only the file indexes that are deleted which makes it difficult for you to search the file and retrieve it. Well, all thanks to EaseUS free data recovery software, you can now recover all of your lost data from the depths of your computer or storage device with great ease. 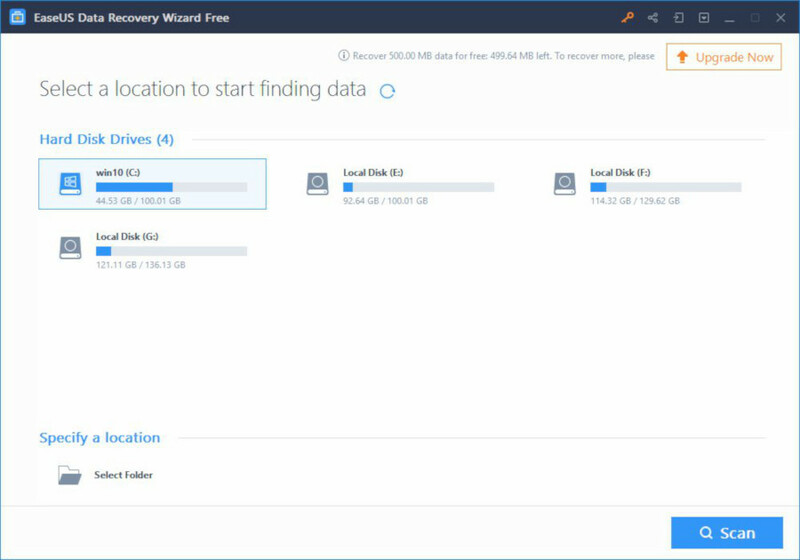 The EaseUS Data Recovery Wizard is a free wizard that can recover your lost documents, files, pictures, videos and any other data. No matter how the data got lost, be it accidental deletion, operating system crash, virus attack or any other situation, EaseUS free data recovery software can help you solve this problem. Moreover, it is compatible with all kinds of Windows operating systems, including; Windows 10/8.1/8/7/Vista/XP, Windows Server 2016/2012/2008/2003. When the operating system crashes you can download the WinPE bootable media that will help you start your computer safely and also recover the lost data from your device. EaseUS free data recovery software can recover the lost data from your personal computer/ laptop, hard drive, pen drive, USB drive, SSD card, Micro card and any other storage devices in case of a crash. And now with the improved free version of EaseUS data recovery, you can retrieve the lost data by scanning the storage devices thoroughly. The great thing about EaseUS free data recovery software is that it is very simple to use. And, it also provides you with a complete guide to locate and retrieve your lost data. You can also get a preview of the files before you recover them so that you do not waste your time and storage space in recovering useless data. EaseUS file recovery is simple, fast and efficient. You can easily get hold of all of your lost data in just three clicks. Here is a simple guide of how you can recover your data using EaseUS free data recovery software. The first step is to download the free version of the EaseUS data recovery software. You can do this by visiting their website. The free version offers recovery of 500 MBs. However, you can earn up to 2GBs of free data recovery by following the instructions provided and sharing the software on your Facebook, Twitter and other social media accounts. Downloading the free version of EaseUS data recovery will help you recover many types of files that are lost due to different data loss scenarios. However, it does not include the downloadable WinPE. Now that you have downloaded the free EaseUS data recovery software, you can start using it by simply opening the software and selecting the drive from where your data was lost after the crash or virus attack. After selecting the drive, all you have to do is click the ‘Scan’ button provided at the bottom. Quick scan searches the existing files that can be easily approached. It is a fast scan, as the name suggests, and it might take only a few seconds to complete. Deep scan takes a bit longer than quick scan and as a result more data is found through deep scan because of this. The quick scan will only take a while, and after it is completed, deep scan will take place to further search for the files that can be recovered. The deep scan will take a few minutes to search into the file indexes. It will only take a while before you can start recovering all of your valuable lost data. As the scan completes, you can now choose the files, documents, pictures, videos or any other data that you want to recover from the scanned data. After that, simply click the ‘Recover’ button provided at the bottom right. Now, the program will ask you to choose a location of your recovered data, make sure that you do not select the drive from where you recovered your data in the first place. Well, congratulations! Your lost file has now been retrieved. EaseUS has made data recovery such a simple process. You follow these easy steps and recover all of the lost data in the matter of few minutes. EaseUS data recovery software has certainly made our life much easier. Now that you know how simple it is to recover files you do not have to worry about losing your important data ever again. However, it is good to have a backup of your data at all times!